At the United Fresh show in Chicago last week, HALOPACK introduced the innovative HALOPACK tray. 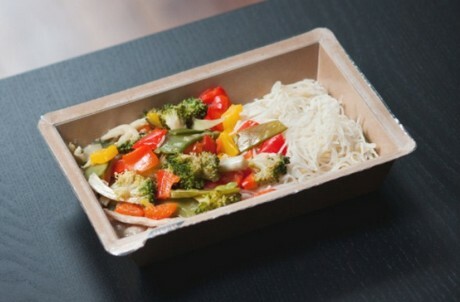 In April of last year, the tray was launched on the Dutch retail market after a long development process. Both Albert Heijn (the biggest retail chain in the Netherlands) and COOP successfully implemented the tray and embraced its potential as packaging material for quality food that not only looks good, but comes with outstanding performance in conservation, logistics and sustainability. HALOPACK is the first fully gas-tight cardboard MAP packaging. It's environmentally-friendly and made airtight by a top seal. The shelf life is greatly prolonged which contributes to reducing food waste. HALOPACK's cardboard packaging provides a higher barrier than standard PP-PE or PET packaging. It extends shelf life of fresh foods substantially in combination with a ‘fresh’ perception towards consumers and saves costs in production, logistics and transport. A sound innovation that came with the joint knowledge of cardboard, plastics and food. The HALOPACK® cardboard packaging has a patented design that is fully sealable and has unique inline production possibilities that deliver even more benefits for transportation, logistics and conservation of the packed product resulting in further reducing food waste. HALOPACK® is produced with renewable or even recycled cardboard, without sacrificing the quality of the food in the tray.